We have struck an inviting, convivial tone, with a cuisine which is at once simple and flavourful, with elaborate plates based on simple fresh ingredients depending on the season. The natural calm and the dappled shade of the terrace guarantee an agreeable pause for relaxation, comtemplation and pleasure. 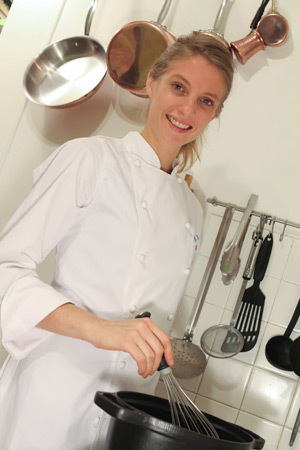 Armelle KRAUSE is an up and coming chef from the Ecole Supérieure de Cuisine Française Grégoire Ferrandi in Paris. After many years producing excellence for some of the most demanding “grands chefs” in France, such as Guy MARTIN of the Grand Véfour, Didier ANIES at the Grand Hôtel du Cap Ferrat, and notably Gérard BESSON in Paris, Ms. Krause has developed a taste at once refined and personal: creations based on a deep respect for nature and the magic of tradition. Alongside Julien PASCAL, her partner, they decided to take on the project of Le Clos aux Roses in order to bring their shared passion and experience to their guests. Most of the dairy produce is from the dairy of Verneuil s/Indre (37). Le Domaine Sanguiers, and the Deschamps cheesemakers of Chambourg s/Indre (37) provide the traditional goats’ cheese of the region. The majority of the wines have been selected and provided by local partners of the Loire Valley. Depending on availability, our Chef chooses high quality producers, growers and fisheries from the local region. Often a hunch based on Armelle’s experience, one could even say “love at first sight”, when out choosing ingredients leads to extra dishes not included in the à la carte menu.